Longreach is a town in Central West Queensland, Australia approximately 700km from the coast, west of Rockhampton. You've now added Longreach Region Visitor Information Centre to your itinerary. 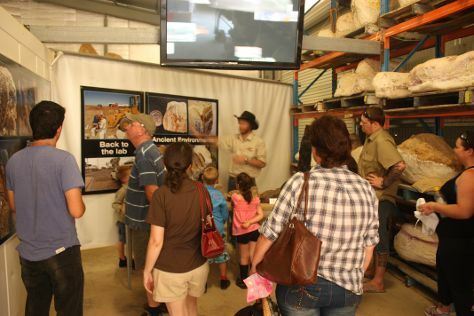 Start off your visit on the 7th (Sat): get all the information you need at Longreach Region Visitor Information Centre. 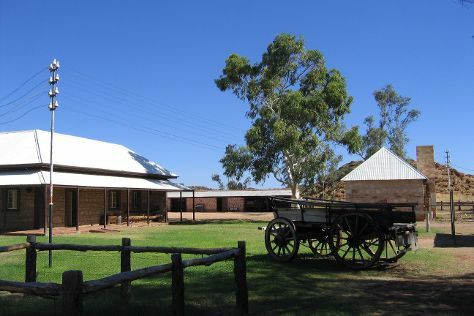 To see more things to do, ratings, maps, and other tourist information, you can read our Longreach itinerary planning site . Yeppoon to Longreach is an approximately 7-hour flight. You can also drive. In September, daytime highs in Longreach are 34°C, while nighttime lows are 15°C. On the 8th (Sun), wrap the sightseeing up by early afternoon so you can travel to Winton. Winton is a town and locality in the Shire of Winton in Central West Queensland, Australia. Your day-by-day itinerary now includes Australian Age of Dinosaurs as well as Arno's Wall. Kick off your visit on the 8th (Sun): examine the collection at Australian Age of Dinosaurs. For traveler tips, maps, and other tourist information, go to the Winton road trip planning site . You can drive from Longreach to Winton in 2 hours. On the 9th (Mon), wrap the sightseeing up by early afternoon so you can travel to Boulia. Boulia is a remote outback town and locality in the Shire of Boulia in Central West Queensland, Australia. To see photos, more things to do, and tourist information, use the Boulia trip itinerary site . You can drive from Winton to Boulia in 5 hours. Alternatively, you can fly. You'll set off for Alice Springs on the 10th (Tue). On the 10th (Tue), take in the exciting artwork at Talapi, then contemplate the long history of Alice Springs Telegraph Station Historical Reserve, and then look for all kinds of wild species at Alice Springs Desert Park. To see maps, reviews, and tourist information, refer to the Alice Springs trip itinerary maker app . Traveling by car from Boulia to Alice Springs takes 8.5 hours. Alternatively, you can fly. In September, daytime highs in Alice Springs are 32°C, while nighttime lows are 11°C. You'll have a few hours on the 11th (Wed) to wrap things up before traveling to Uluru-Kata Tjuta National Park. Step out of the city life by going to Kuniya Walk and Kata Tjuta. You'll explore and learn at Uluru-Kata Tjuta Cultural Centre and Walkatjara Art. And it doesn't end there: appreciate the views at Valley of the Winds, head outdoors with Walpa Gorge, don't miss a visit to Uluru, and trek along Uluru Hiking Path. For other places to visit, where to stay, and more tourist information, refer to the Uluru-Kata Tjuta National Park route planner . You can do a combination of taxi and flight from Alice Springs to Uluru-Kata Tjuta National Park in 2 hours. Another option is to drive. September in Uluru-Kata Tjuta National Park sees daily highs of 33°C and lows of 12°C at night. You will have some time to spend on the 14th (Sat) before leaving for home.